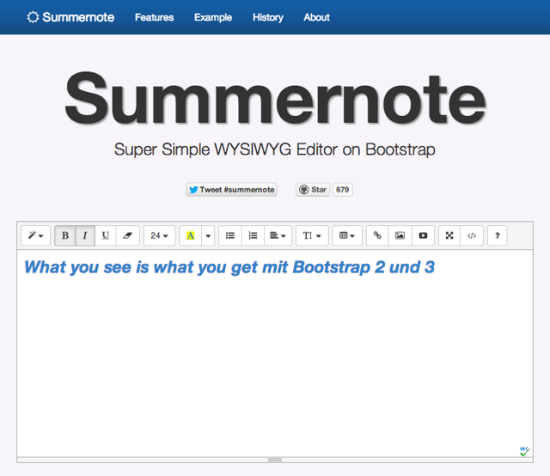 Summernote needs Bootstrap from 2.x upwards. It also depends on jQuery and uses FontAwesome. Thus, those two are to be implemented, too. This shouldn’t be a problem, as they are part of the Bootstrap package anyway. Simply rely on a complete Bootstrap framework and you’re good to go. Make sure to define the doctype as HTML5. A number of callbacks allows for more interactions. Using language files, Summernote works with any language of the globe. You’ll probably have to create your own file, though. The desired language is configured via a parameter to the function call. This is all pretty straightforward and comprehensible. You don’t need elaborate documentation to find your ways around. Though you won’t need it to get started, it is nice to see, that Summernote comes equipped with a thorough documentation explaining all the bits and pieces. If you know Open Source, you also know that giving good documentation is not always the rule. Summernote’s documentation contains some very useful demos and examples to get you going. Even server-side implementation with PHP or Node.js is covered. The tool integrates a file-uploader and is able to embed videos from around the web. 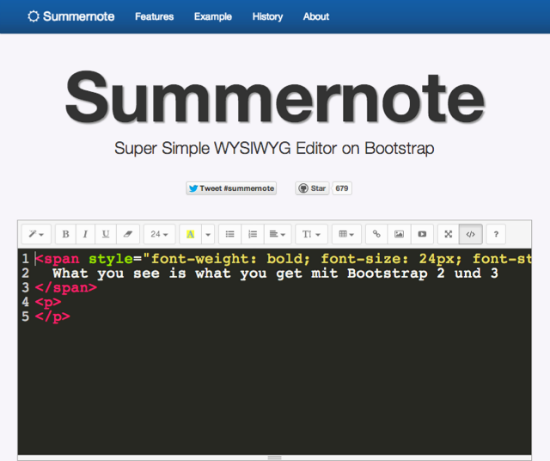 As you’d expect from a Bootstrap-related script, Summernote works fully responsive. Not the least interesting features should be the low weight of just 58kb for the CSS and JS combined. The lean editor Summernote just reached version 0.5 and can be downloaded free of charge from Github. It is freely usable for private and commercial projects alike, as long as you stick to the terms of the very liberal MIT licence. Summernote works in all modern browsers and the IE from version 9 upwards. I don’t see why, but support for IE 8 has been announced to be coming soon. WTF? Anytime heard of semantics? Usually I just copy the code from getbootstrap docs. This might speedup my workflow a little. Thanks for the cool freebie.